Art Express students work on paintings. NIU’s Community School of the Arts is offering several classes in art and music this fall. Start your pre-school child on the path of musical knowledge with Musical Tales, a new class offered this fall. The class combines a story with musical activities and meets at 6:30 p.m. Tuesday evenings beginning Sept. 14. Musical Tales is a six-week class designed for children ages 3 to 5. Each class begins with a story and follow-up musical activities are planned to bring movement and life to the story. In fall, there are two six-week sessions. The second session begins Oct. 26. The class is taught by longtime piano teacher and local music educator Sara Vogeler. 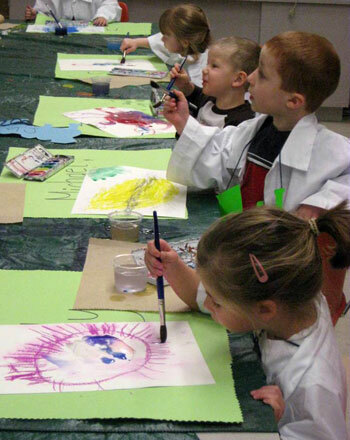 Children who enjoy creating original artwork are sure to have a great time at Art Express this fall. The class begins Saturday, Sept. 11. Children ages 4 to 12 are divided by age to work on interesting projects during this five-week class. The atmosphere is fun and intensive. The classes are taught by NIU School of Art education students who are supervised by faculty. The curriculum changes every semester. Art Express meets from 1 to 3 p.m. All materials are supplied. Music theory forms the building block for successful musical study. Learn more this fall in Paper Free Music Theory. The aim of the class is to improve reading, memorization and improvisation skills. The class focuses on learning by listening. Students are asked to bring their instruments to class and are expected to have a good working knowledge of their instruments. The class meets from 6 to 6:55 p.m. for 12 Mondays, beginning Sept. 13. The class is geared towards students ages 12 and older. Teacher Eric Schroeder is an experienced teacher and performer. He has taught guitar lessons to children and adults using both the Suzuki and traditional methods. Two group classes are being offered this fall to give people interested in learning guitar and piano a fun alternative to private lessons. All classes are taught in the Music Building. Guitar Basics meets Wednesdays evenings. Section 1 is for ages 9 to 12 and meets from 5 to 5:55 p.m. Section 2 is for ages 13 to adult and meets from 6 to 6:55 p.m. Both classes are designed for beginners. Students learn the fundamentals, including reading music, playing songs and playing scales and chords. The fee includes the cost of a book. Quentin Dover teaches the class. He is a graduate of NIU, where he majored in music and studied guitar with Fareed Haque. He has been teaching guitar for many years. Group Piano for Adults meets Monday evenings and is for ages 18 to adult. Level 1 meets from 6:15 to 7:10 p.m. and is for beginners. Skills learned include the basics of piano technique, reading music on the grand staff and learning some basics, including scales and intervals. Level 2 meets from 7:15 to 8:10 p.m. and is for those who have taken Level 1 or who have good foundation on the instrument. Susan Breitner-Hurm teaches the class. A longtime teacher and pianist, she has taught piano for the community school for several years. The office of the NIU Community School of the Arts is located in Room 132 of the Music Building. For more information, call (815) 753-1450.